ATLANTA, GA - (@TheComedyNews) - The NCAA announced they will begin paying student athletes for any injury during March Madness that boosts ratings and keeps the tournament trending on social media. This development stems from the gruesome and much-talked about broken leg suffered by Louisville Cardinals Men's Basketball guard Kevin Ware. The injury had made national news headlines and has garnered over 2 million YouTube views. 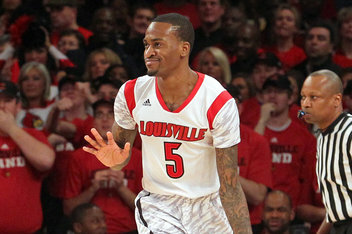 s brought to the NCAA tournament," NCAA spokesman Ben Sherman said. "We reached audiences who otherwise would never be interested in the sport." The NCAA's plan to begin to pay athletes who sustain injuries that gain more attention for the sport has piqued the interest of coaches---many who feel they should be allowed in on the action. Several coaches pointed to former Indian Hoosiers coach, Bobby Knight---who often would leave fans wondering what inanimate object would end up on the court each night. Rutger's coach Mike Rice is the only coach to really plead his case for inclusion in the NCAA's self-promotion marketing plan. Coach Rice submitted his audition tape taken from clips of organized scenes he edited together from the Rutgers basketball team's best practice clips. The tape has already made the news rounds, but just doesn't seem to give off the same sympathetic feel that has drawn in a larger audience to Kevin Ware's very deliberate leg injury. The NCAA also admitted they will be paying for the hospital expenses Kevin Ware will have as he embarks on the long road to recovery. NCAA spokesman Ben Sherman spoke at Ware's hospital bed saying "The NCAA will foot Kevin's medical bills. We'll be here at every leg of his journey." You're the best. Here's to a swift recovery. And to the doctor performing the surgery: break a leg--we're all counting on you. Lol.